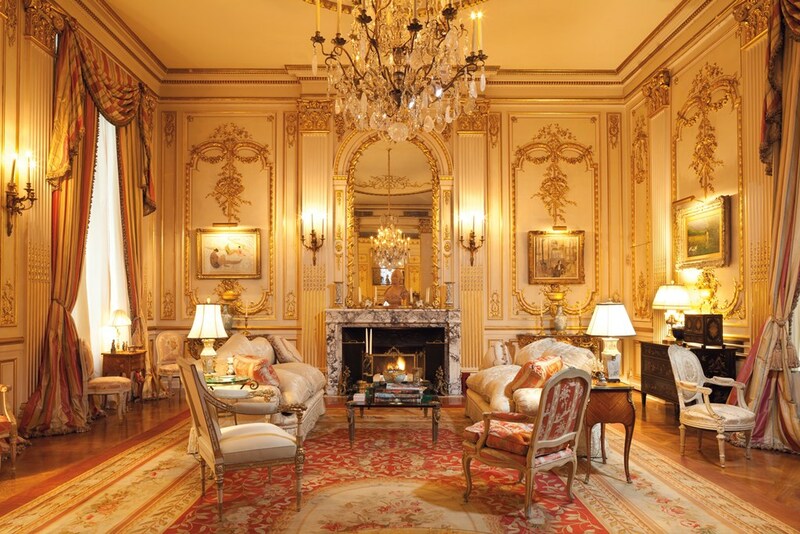 The Manhattan townhouse featured here today is the not the kind of home one sees very often these days, and that's a shame. 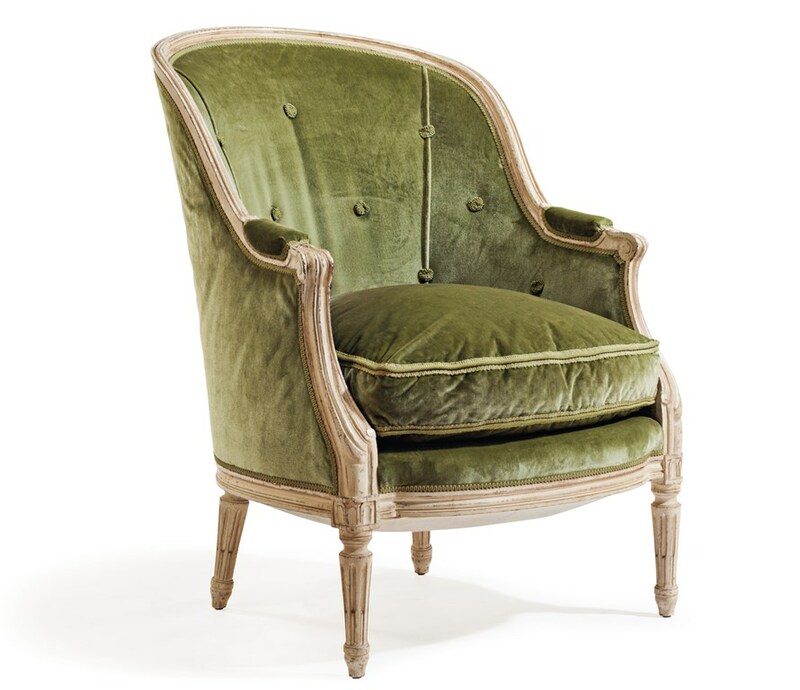 Some might deem it too formal and stuffy, while others will simply declare it "grandma", the now-popular term of derision for any home that has antiques and traditional fabrics in it. 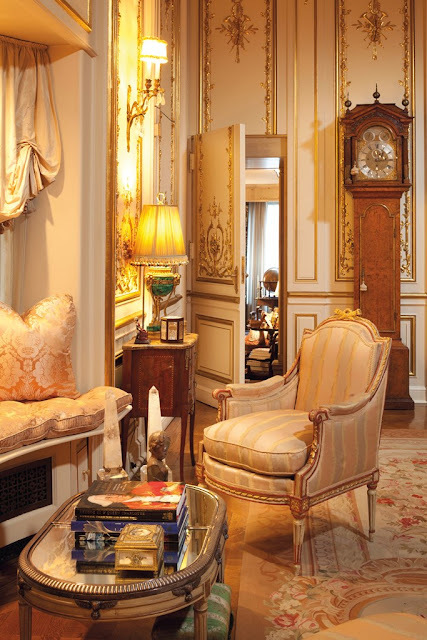 But it's precisely those attributes- antiques, beautiful fabrics, and traditional furnishings- that make this townhouse remarkable. 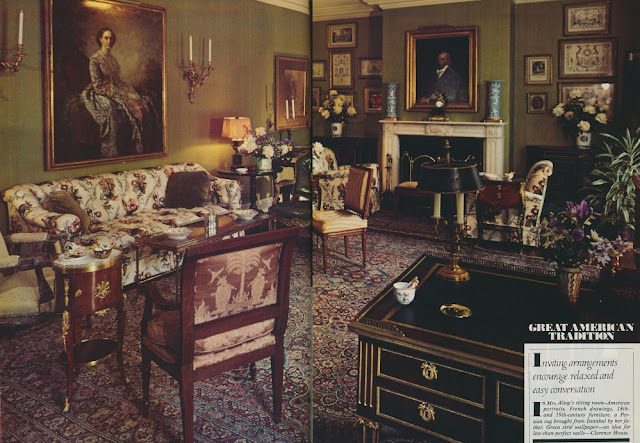 Oh, and the fact that the interiors, seen here in photographs from a 1984 issue of Architectural Digest, had changed very little since they were first installed in the 1920s. 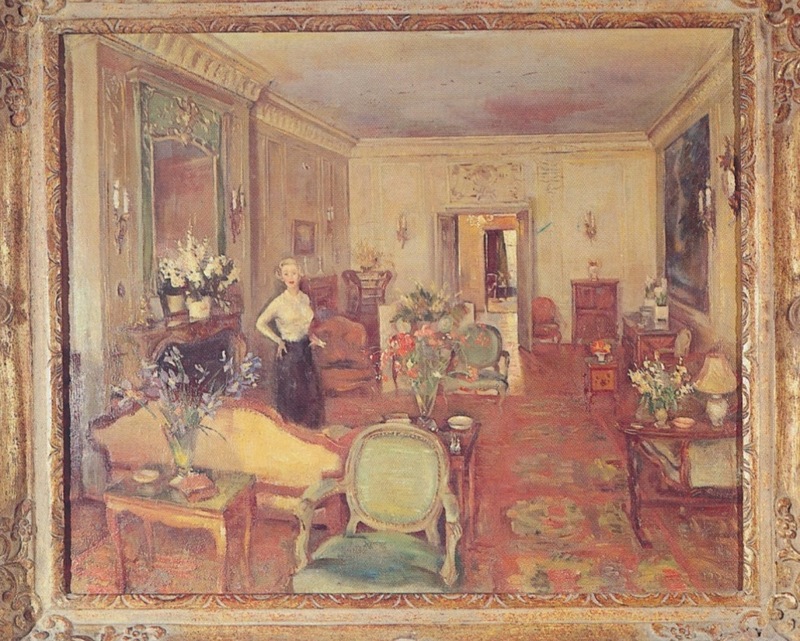 The townhouse belonged to Mrs. Edgar W. Leonard (Adelaide), a popular figure in society who can be seen in the painting above. 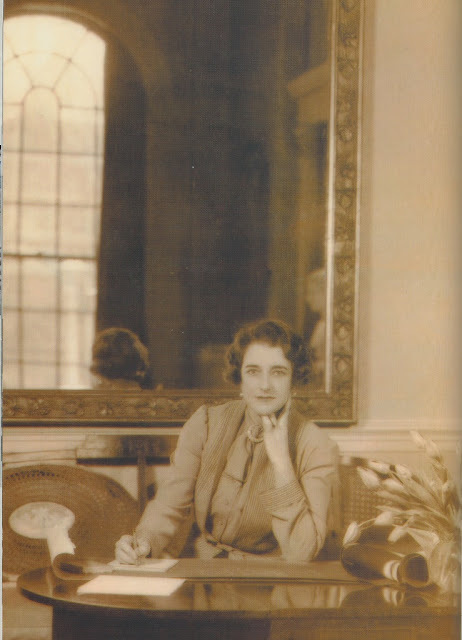 According to the AD article's author, Susan Mary Alsop, Mrs. Leonard was vivacious and fun, known for her "celebrated parties in the 1920s and 1930s." Mrs. Leonard's friend, Mr. Winston "Winky" Thomas, concurred, admiring the food she served ("Old-fashioned American food of the best kind- the first tiny green peas, the first corn, the first soft-shell crabs, and plenty of everything.") and the mischief she fostered ("Adelaide, who was flirtatious herself, loved to encourage her friends' flirtations. Nothing serious, you know- a man might have a summer's dalliance while his wife was somewhere else.") So even if you find the dining room, below, just a tad bit stuffy-looking, you now know that the dinner parties were anything but. 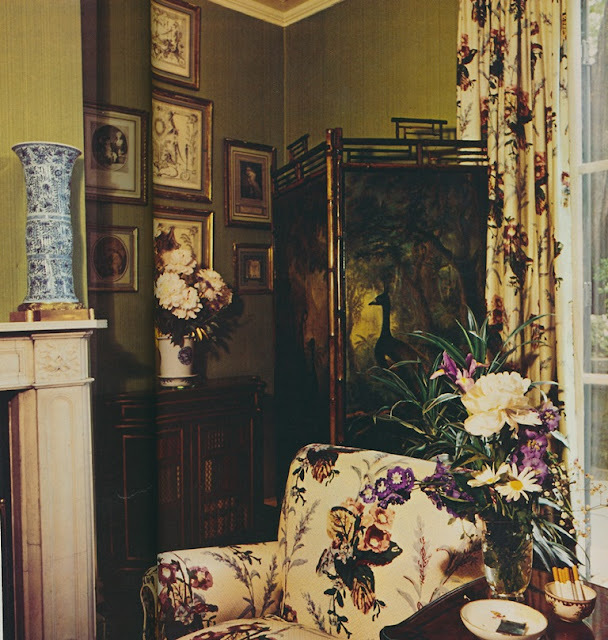 While the article credits Mrs. Nancy Pierrepont, the talented society decorator, with assisting with the interiors, Mrs. Pierrepont insisted that she only helped Mrs. Leonard refresh fabrics and furniture every now and then. 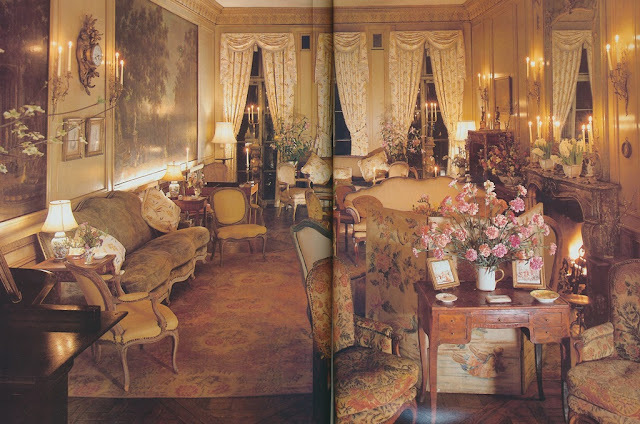 What is extraordinary is that when you study the painting above, done by Troubetzkoy in 1925 and capturing Mrs. Leonard in her drawing room, and then compare it to the 1984 photo of the drawing room below, you'll see that very little changed through the years. 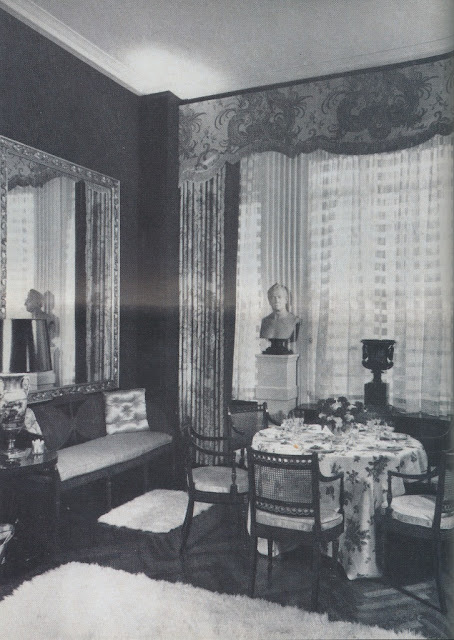 The furniture placement, and, in fact, much of the furniture, remained the same. And speaking of the drawing room, have you ever seen such an elegant and gleaming room? The paneled walls positively glowed thanks to ample candlelight. 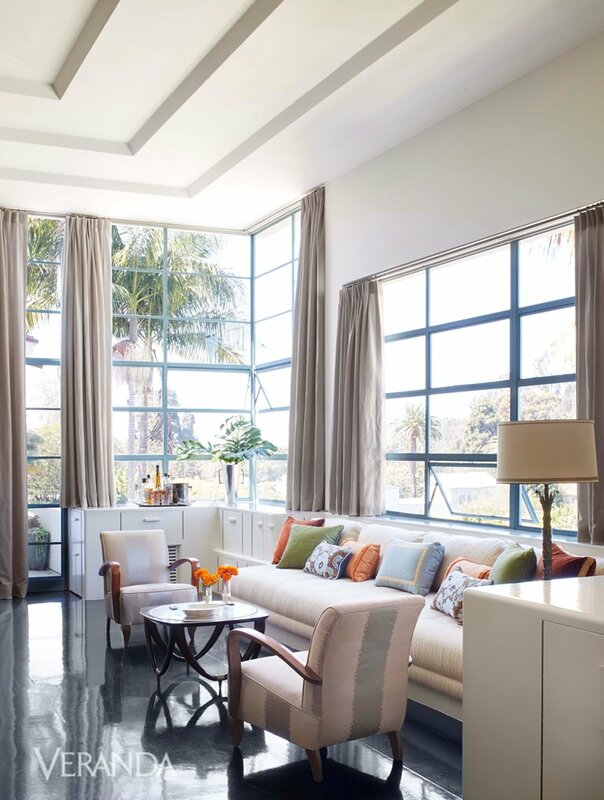 Now, this is how a room used for nighttime entertaining should be done. With a home like this, it's no wonder Mrs. Leonard's parties were first-rate. The townhouse's entrance hall was the first indication that much of the home retained its early interior finishes. 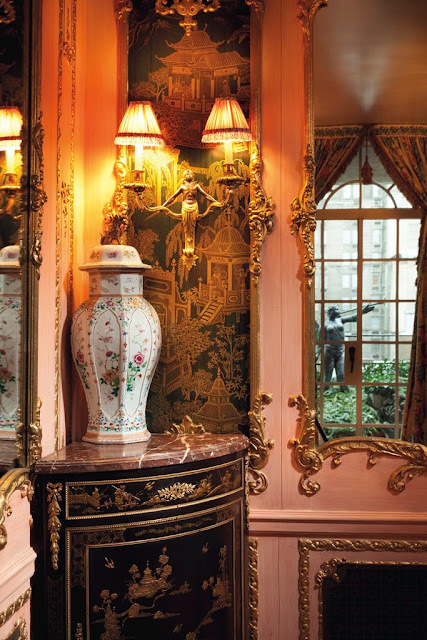 A corner of the drawing room, with its antique French furniture and Chinese Export porcelains. 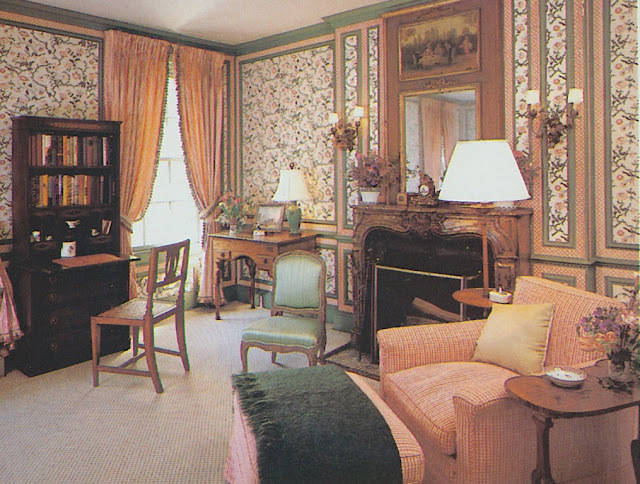 The drawing room. Susan Mary Alsop described it as having a "cosmopolitan sensibility." And it does. 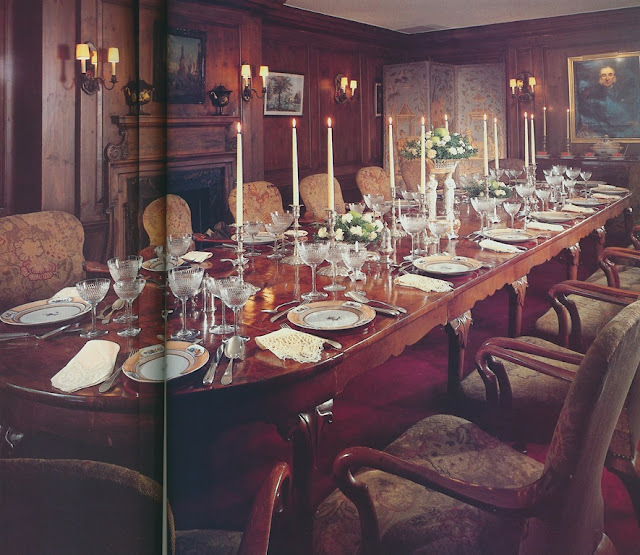 The dining room, where good food and mischief was served up. During one dinner party, a young Yul Brynner provided violin music. 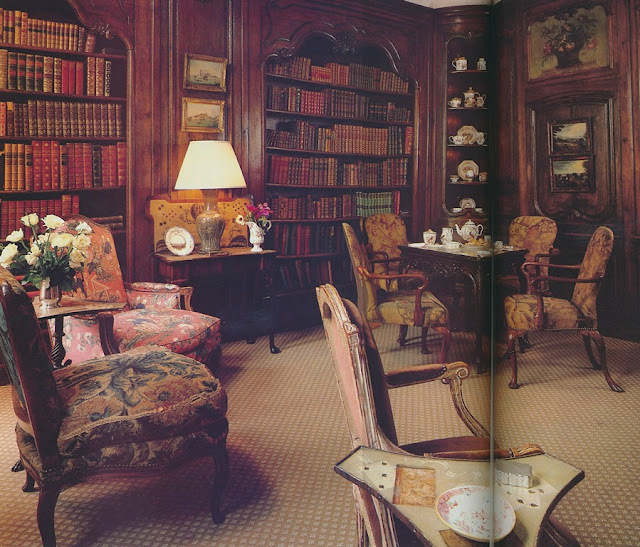 The library, where guests were entertained during small parties. 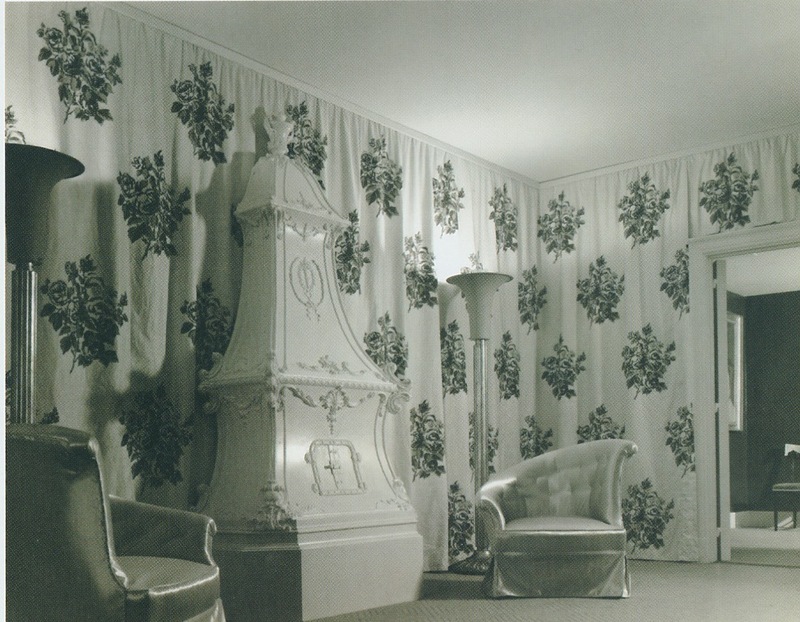 A guest room, furnished with fabrics and wallpaper by Brunschwig & Fils. 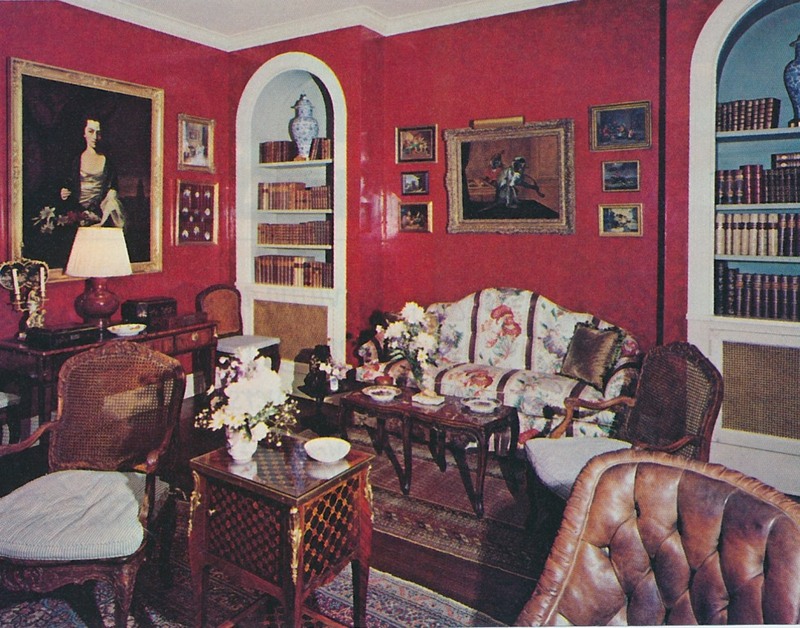 When I started my blog back in 2006, I wrote frequently about Dorothy Draper, who remains my all-time favorite decorator. From the time I first saw her work, I was enthralled with Draper's sense of theatricality, which, still today, exhilarates me. But after referencing her in those old blog posts every chance I could get, I reluctantly had to put Dorothy on the back-burner. All of a sudden, it seemed that Dorothy and her work were everywhere, splashed all over the internet. Although I didn't grow tired of her work, I felt that I needed to give it a rest. When something you love becomes ubiquitous, it means it's time to focus your attention elsewhere. But then, a few days ago, I flipped through my copy of The High Style of Dorothy Draper, the catalogue that accompanied the Museum of the City of New York exhibition on Draper, which I attended back in 2006. 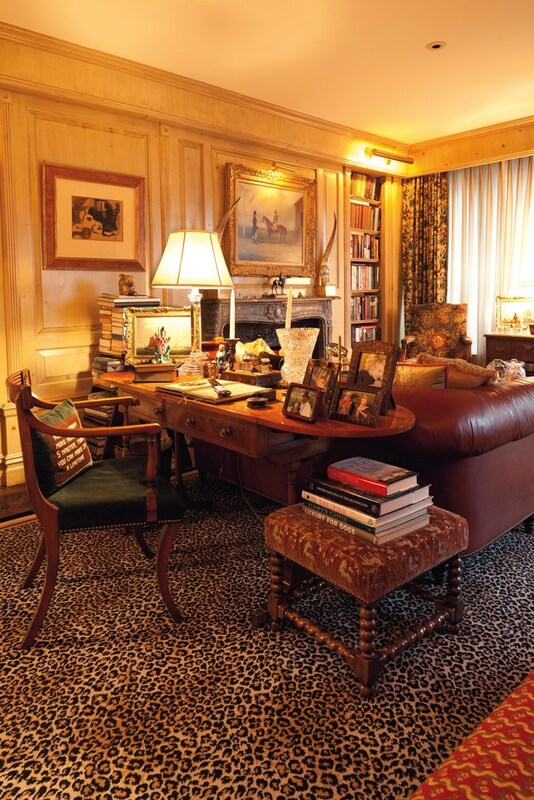 Becoming reacquainted with those great, old black-and-white photos of The Carlyle, Hampshire House, and her apartment at The Carlyle especially, I was reminded of how much I love her work- and how much I miss writing about her. There isn't a lot more to be said about Draper that hasn't already been said before. And, likely, you've seen most, if not all, of the published photos of her work. But now that the Dorothy Draper-mania of recent years has simmered down, it seems like now is a good time to cast my focus back to this legendary original. The Lobby of 117 East 72nd Street, 1929. 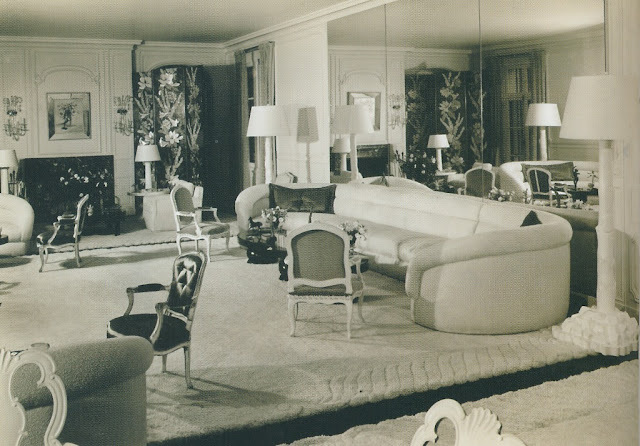 Draper's apartment at The Carlyle, c. 1960. 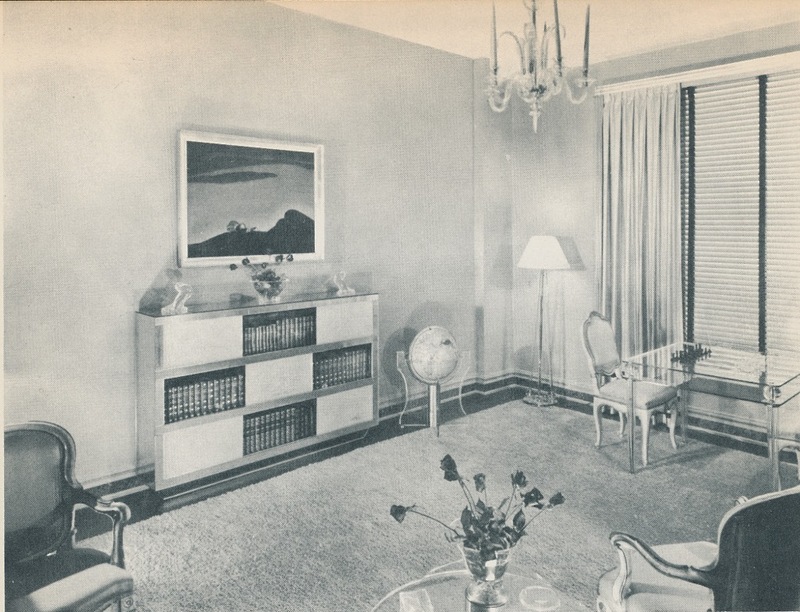 The Blumenthal apartment at Hampshire House, c. 1937. 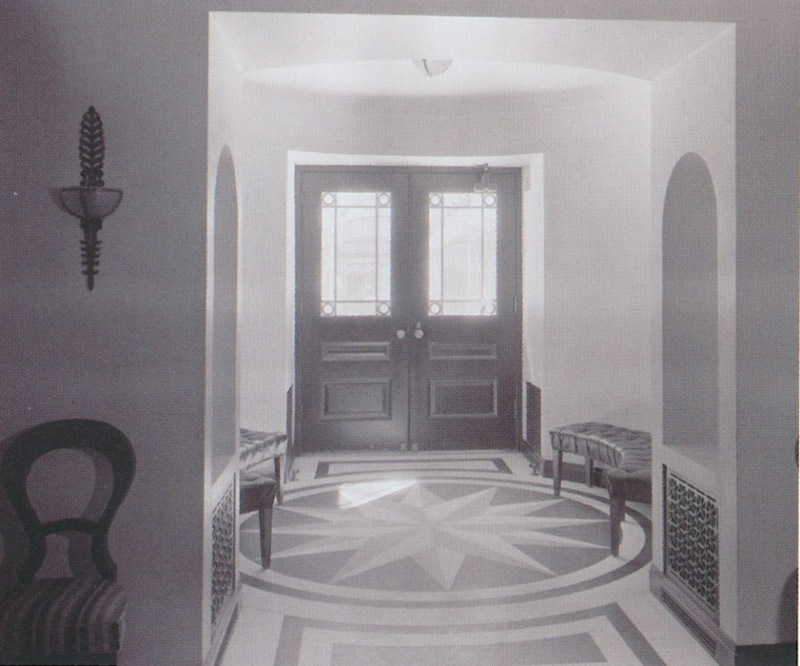 Entrance to the hospitality suite at Hampshire House, c. 1937. 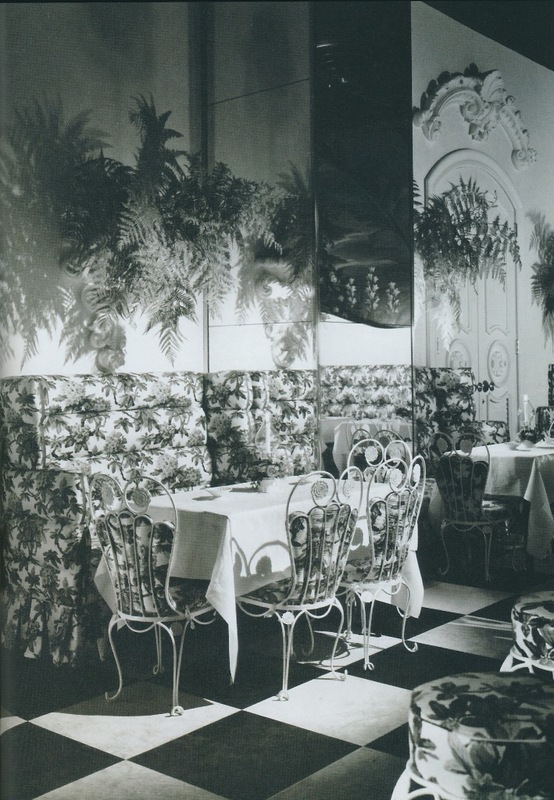 Terrace outside of The Camellia House Supper Club, The Drake Hotel, Chicago; c. 1941. 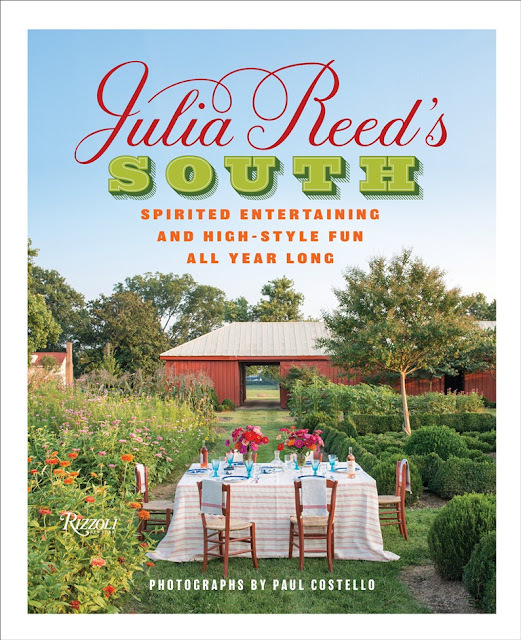 Before some of you check-out for the summer, I must tell you about one of my favorite Spring book releases: Julia Reed's South. It's no secret that I'm a huge fan of Julia, and I know many of you feel the same. Not only are we Southerners devoted to her and her recipes, but non-Southerners are, too. 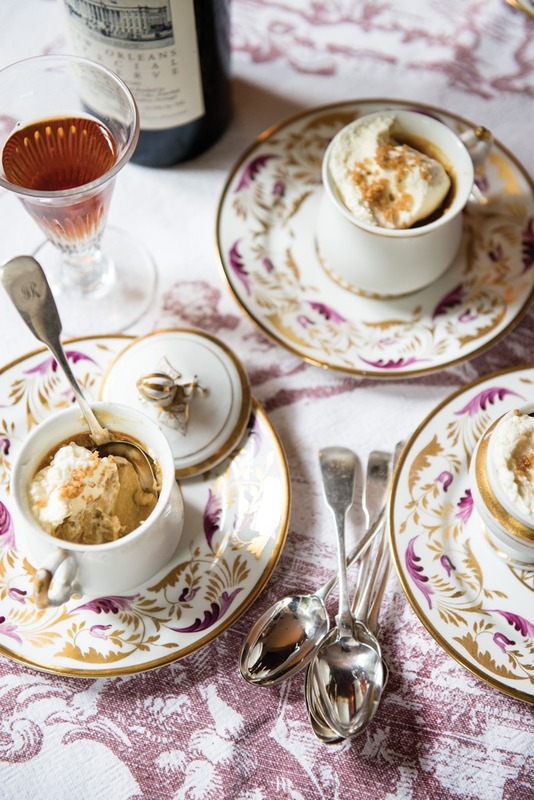 I put Julia in the same category as Ina Garten, both masters of easy, delicious, and fuss-free recipes that practically guarantee successful entertaining. The focus of Julia's latest book is parties, both elegant, pull-out-your-best-china soirees and casual, rollicking bashes. 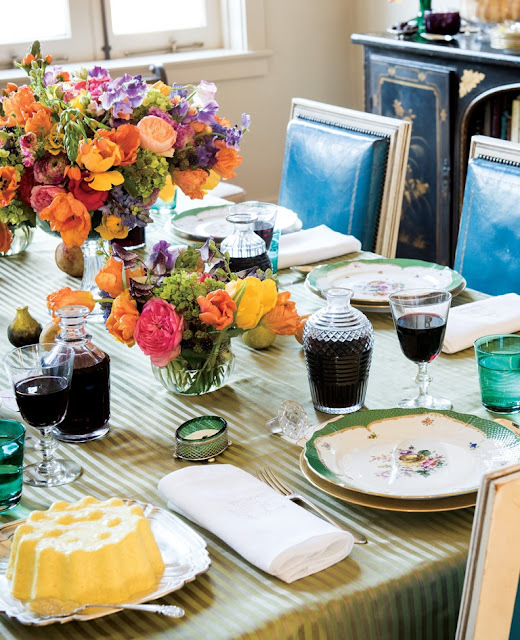 There is a "Cold Creole Supper" with Daube Glacé and Shrimp Rémoulade, and "Tomatopalooza", a celebration of everyone's favorite Summer vegetable with Gazpacho, Tomato Tarte Tatin, and Sliced Chicken Breast with Tomato Vinaigrette. One of my favorite chapters is "The Visiting Dignitary Dinner", whose menu of Rib-Eye Roast and Horseradish Mousse is made even more memorable thanks to Julia's amusing story about the dinner's origins. 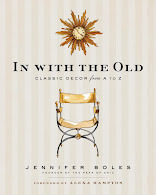 As with all of Julia's books, the text is a hoot, but it's informative, too, with practical suggestions on entertaining and delightful anecdotes about the origins of certain recipes. (Trust me, you will want to read the text.) Equally compelling is the book's photography, shot by Paul Costello. 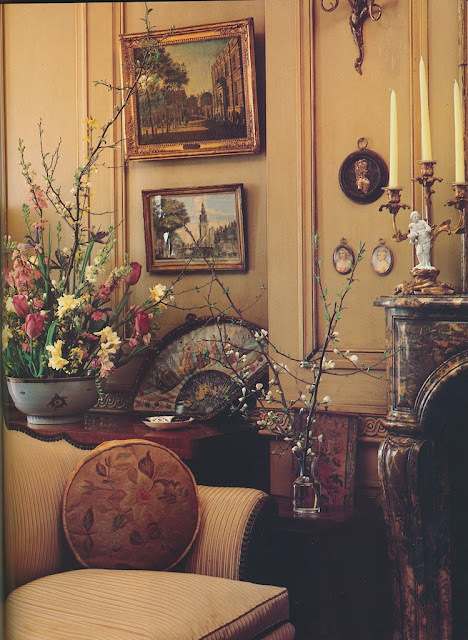 It's refreshing to see tables, sideboards, and entire rooms, for that matter, decorated with antiques, practically a novelty these days. But not every party is quite so dressy. In fact, that's the charm of Julia's book. 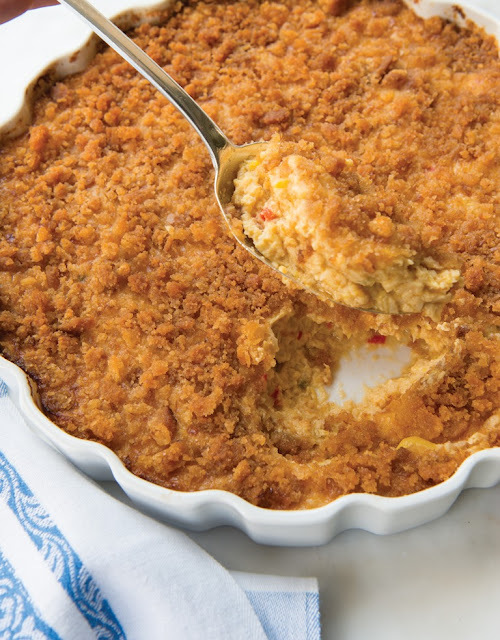 The author is a down-to-earth, Southern cook who knows that sometimes, the best fried chicken comes from the neighborhood grocery store and that for some dishes, crushed Ritz crackers make an excellent crumb topping. Since my kitchen is out of commission at the moment, I have not been able to try any of the recipes for myself. But as soon as I can do so, I'm going to test out the Mock Cheese Soufflé, Green Goddess Soup with Jumbo Lump Crabmeat, and Nancy Peterkin's Summer Squash Casserole, which I have featured below. And if these recipes are half as good as those featured in her previous books, I've got some happy cooking in store for me. Preheat the oven to 350 degrees F. Butter a 2 1/2-quart baking dish and set aside. Place the squash slices in the bowl of a food processor fitted with a metal blade and pulse a couple of times so that the squash is chopped fairly finely. You will likely have to do this in batches. Melt 6 tablespoons of the butter in a large deep skillet over medium heat. Add the squash and sauté for 3 to 4 minutes. Stir in the garlic, bell pepper, jalapeno, and onion. When the vegetables are tender, about 10 minutes more. Remove the skillet from the heat. Meanwhile, crumb the toasted white bread (but not too finely) in the bowl of the food processor. Melt the remaining 2 tablespoons butter in a small saucepan and toss with the crumbs. In a large bowl, place the squash mixture, cracker crumbs, and Cheddar and mix well. Stir in the beaten eggs, cream, sugar, salt, and cayenne. Blend well and pour into the prepared baking dish. Top with the buttered bread crumbs and bake for 40 minutes, until the crumbs are golden brown. © JULIA REED’S SOUTH: Spirited Entertaining and High-Style Fun All Year Long by Julia Reed, Rizzoli New York, 2016. 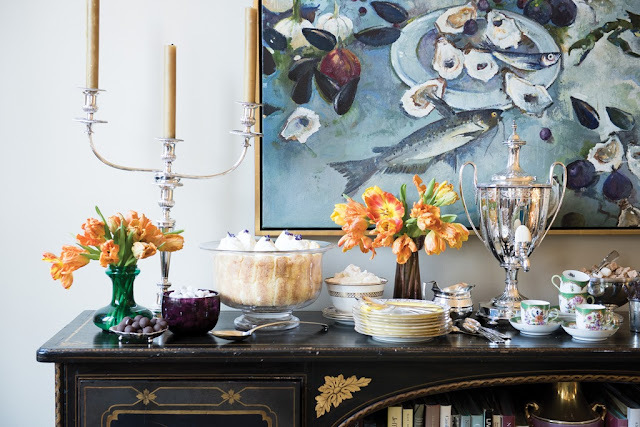 Images from JULIA REED’S SOUTH: Spirited Entertaining and High-Style Fun All Year Long © Paul Costello. All too often, we see photos of legendary houses with once-legendary interiors that have been renovated and redecorated beyond recognition. It is so disheartening to see a prominent house's character, the very thing that made it special, be completely snuffed out by new homeowners and their overzealous architects and designers, who seem to care more about making an impression than preserving any vestiges of the past. And yet, when it comes time to market the newly redone house to publications or real estate websites, the house's storied past is what is most often used to promote it- despite the fact that very little is left to indicate that storied past. 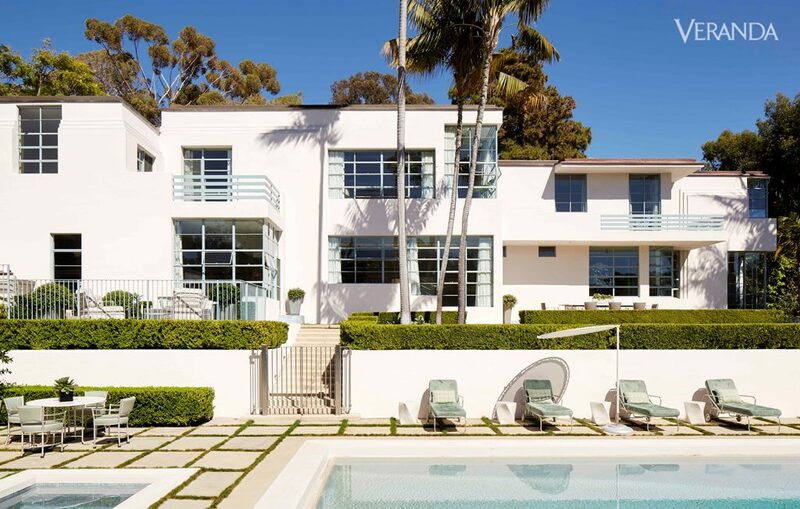 So when I heard that designer Madeline Stuart had recently redecorated the 1930s-era Cedric Gibbons-Dolores del Rio house in Los Angeles, I was skeptical. It's not that I don't admire Stuart's work, because I do. It's just that I've gotten used to fabled houses being given insensitive makeovers. (It's just like what happens in soap operas. A character has a disfiguring accident, and when the bandages are removed, he or she has an entirely different face.) But when I saw photos of the house in the May/June issue of Veranda, I was very pleasantly surprised. Stuart worked her magic on the interiors, and yet, they still feel as though Gibbons and del Rio are lurking somewhere in the background. It's so refreshing to see a designer and homeowners respect the integrity of the house, working with its original architectural features and not against them. If you haven't already done so, I highly encourage you to pick up a copy of the May/June issue, which contains the photos seen below as well as Stuart's thoughts on working on this legendary house. And although the last photo featuring Gibbons and del Rio is not part of the Veranda feature, it seemed appropriate to include it here. 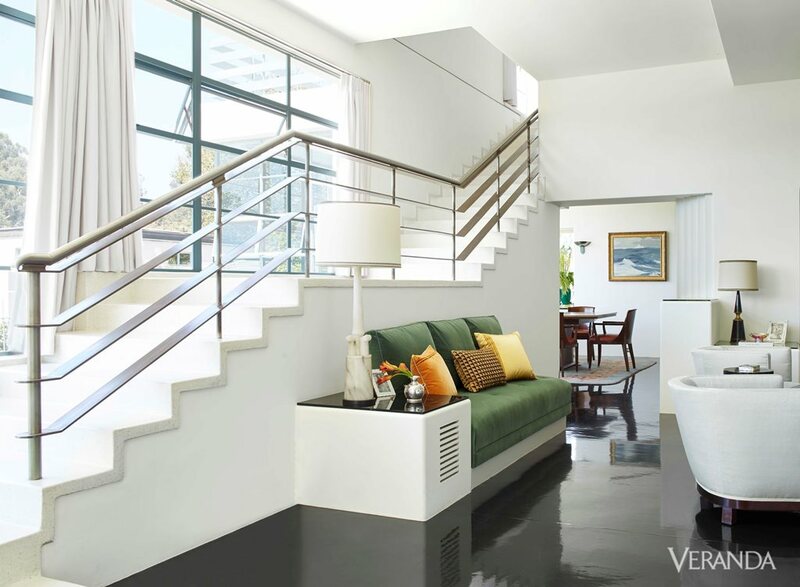 All photos, with the exception of the last one, appear in the May/June issue of Veranda, Max Kim-Bee photographer. My friend Jean and I were recently discussing card tables. While she wishes she had one, I wish that mine wasn't quite so mundane. A collapsible thing that I purchased ages ago from Kmart, the table is far, far from chic. Thank goodness for card-table covers. While chic card tables do exist, I can't imagine that there are as many being produced today as there were back in the early-to-middle part of last century. Back then, playing cards was what one did. There were tame afternoon card games played by the ladies, while evening card games, often dressed-up, coed affairs, were, more likely than not, accompanied by libations and a cigarette or two. 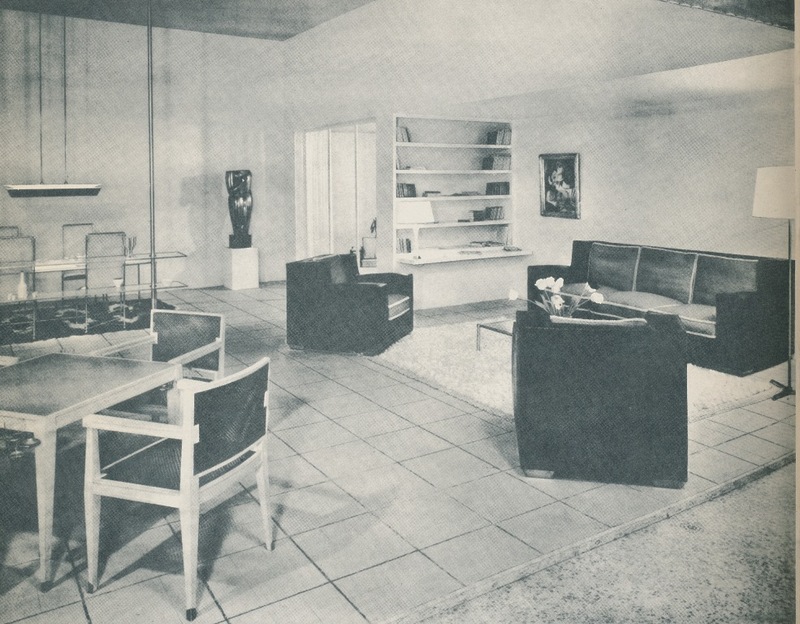 As I was recently flipping through Emily Genauer's 1939 Modern Interiors: Today and Tomorrow, I was reminded of the attention people once paid to the equipment of gracious living, including card tables. 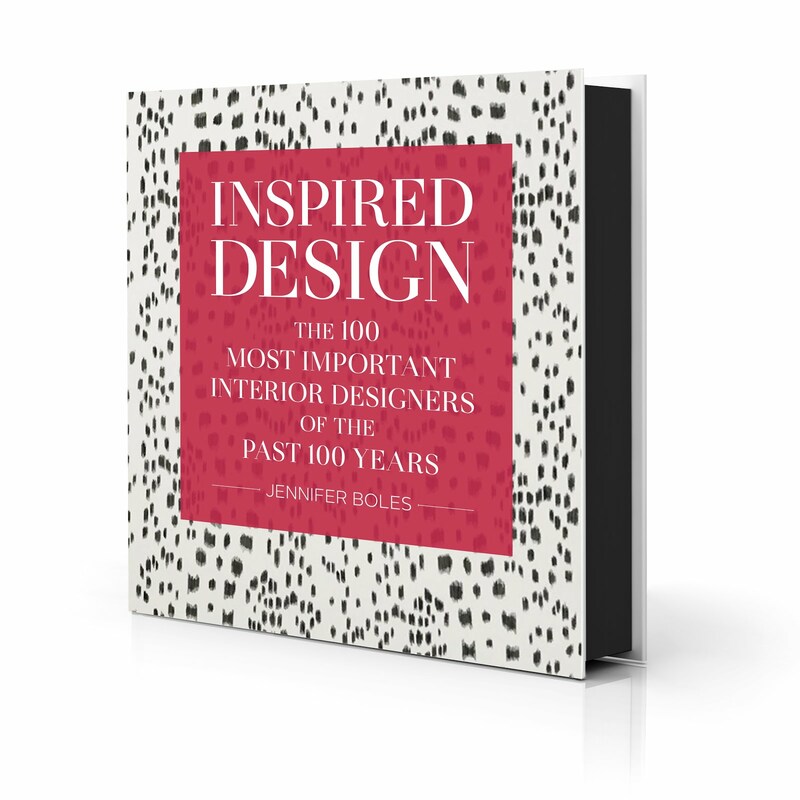 Based on images in this book and others, I'd say that card tables were considered to be almost as important to the home as sofas and dining chairs. And these were not your run-of-the-mill card tables, either. 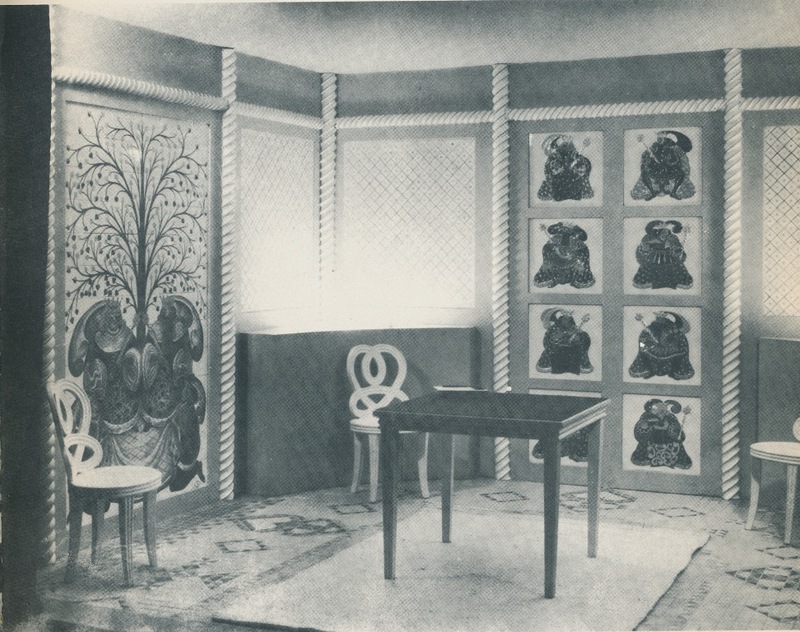 Considering the Thirties was a decade in which new and novel materials for the home were frequently touted, many card tables were made of unique and interesting materials, such as crystal. 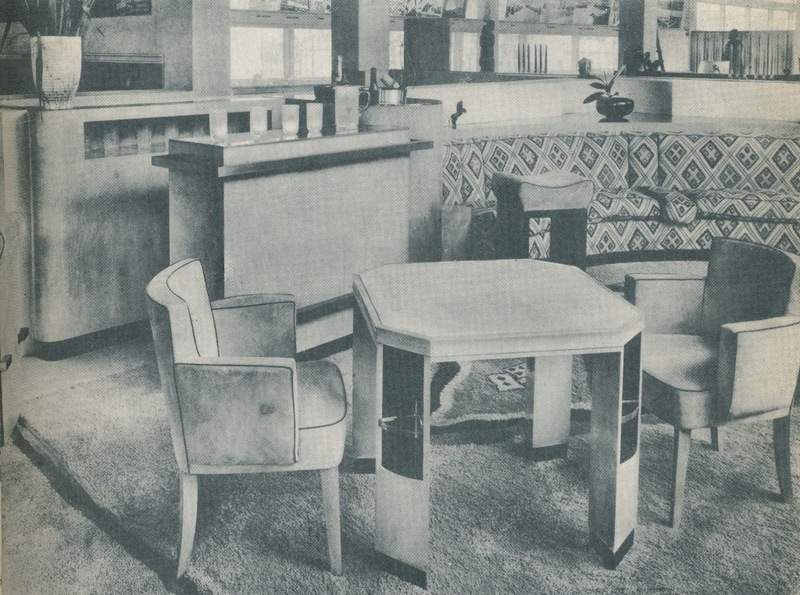 Below, you can see the modern card tables- and their modern surroundings- that caught Genauer's eye. 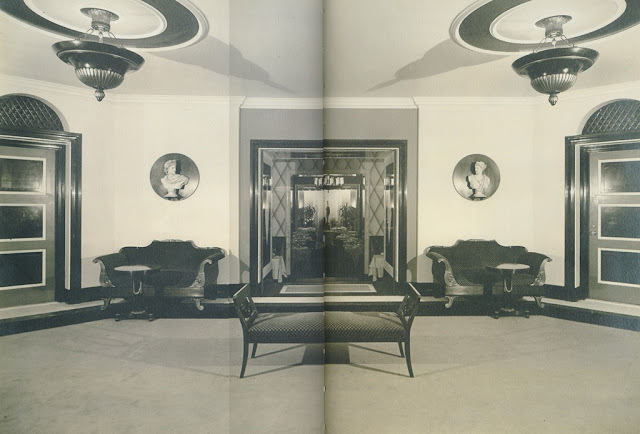 And since drinking and smoking went hand-in-glove with card playing, you'll also see a smattering of bars and one very stylish smoking room. 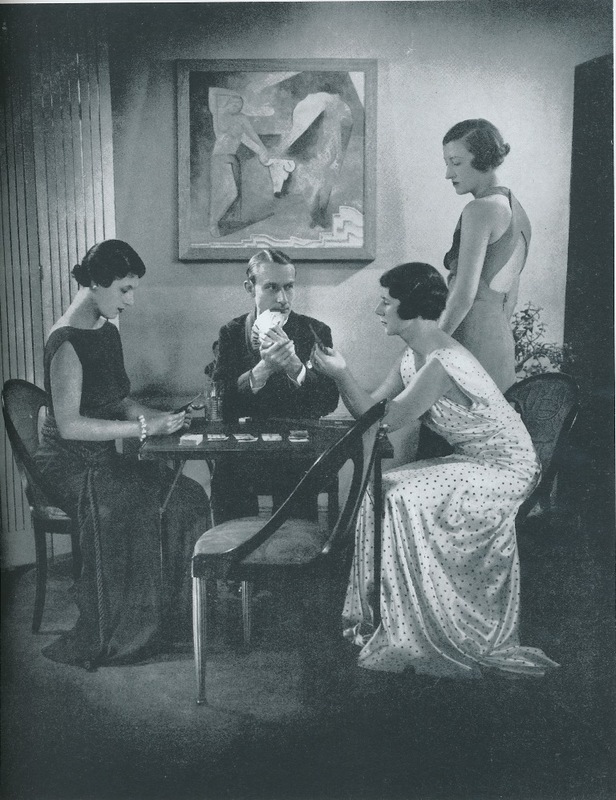 Image at top: A 1933 card game that included Mrs. Edward J. Mathews, Mrs. Charles P. Grimes, Miss Gladys Livermore, and Mr. John Wheelwright. "A gaming corner and bar" that was part of the Belgian Exposition at the Paris Exposition of Arts. Note the drinks shelves that were built in to the table's legs. Also, look at the floor, beyond the table, and you'll see the card motif that was part of the rug's design. Also at the Exposition was this "stunt game room" whose walls, floor, and chairs were made of porcelain. Note the playing card motifs on the back wall. The color scheme was gray, white, and apricot. Genauer suggested that this room should have been labeled, "for phlegmatic players only." Perhaps more gaming than card table, this version, featured in an unidentified American model room, was made of crystal. The top was constructed of two pieces of crystal, which were separated by four crystal balls. The top tier's gaming board was marked by alternating squares of mirror and etched glass. Even the globe holder was made of crystal. 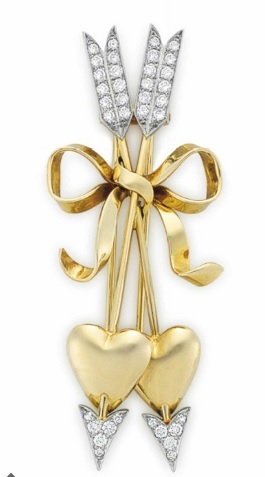 Both pieces were designed by Vicovari. 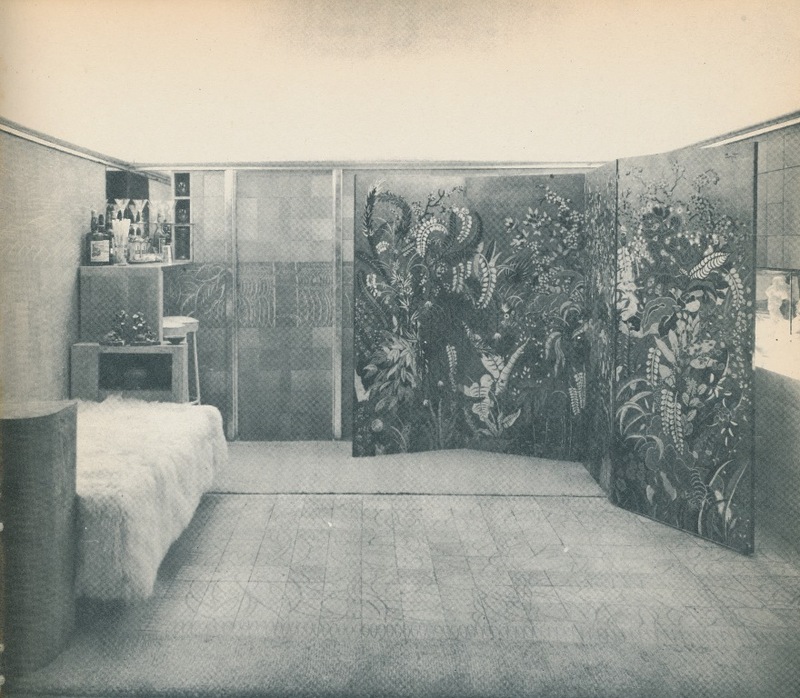 A room at what I believe was the Paris Exposition. Everything one could want for a night of entertainment was here, including a card table and, as Genauer made an effort to point out, a ledge at the base of the bookshelf on which one could display a lamp and smoking accessories. 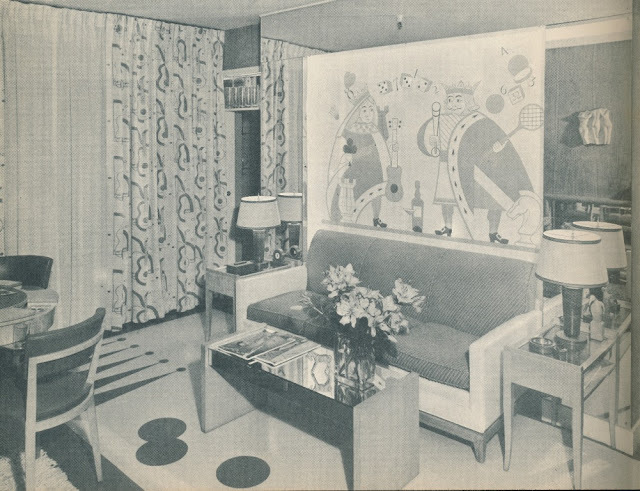 A game room replete with King and Queen panel and guitar-motif curtains. 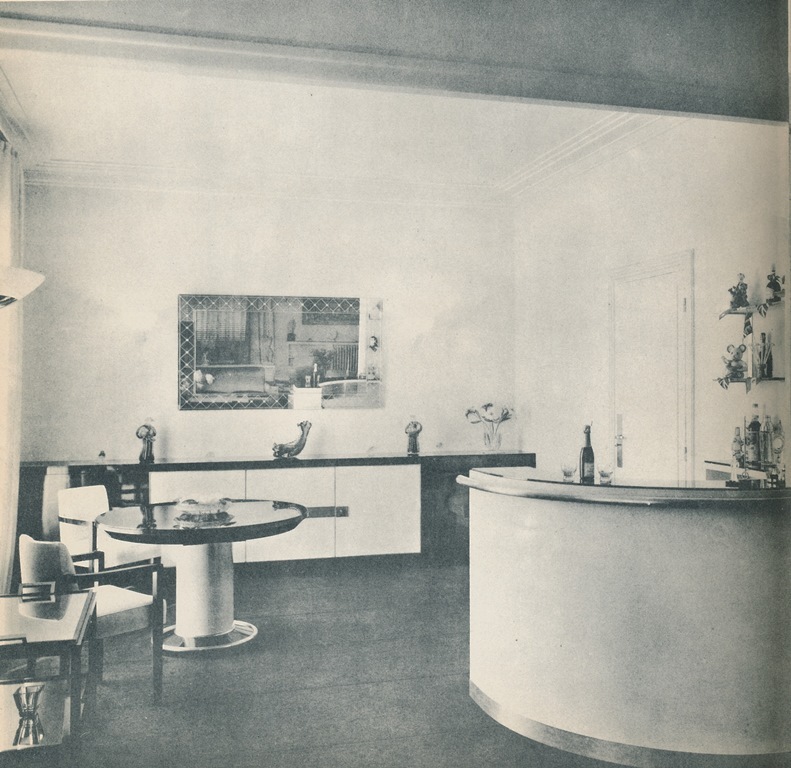 A home bar, which seems as good a place as any in which to play a game of cards. Genauer advocated this type of modern private bar, warning readers about those that resembled "a garish night-club or an English tap-room," which Genauer deemed undesirable and inappropriate. "Apparently of much greater importance to the French in their bars than the liquor itself and the facilities for preparing it, are a beautiful setting and a most comfortable sofa so one may relax while sipping." 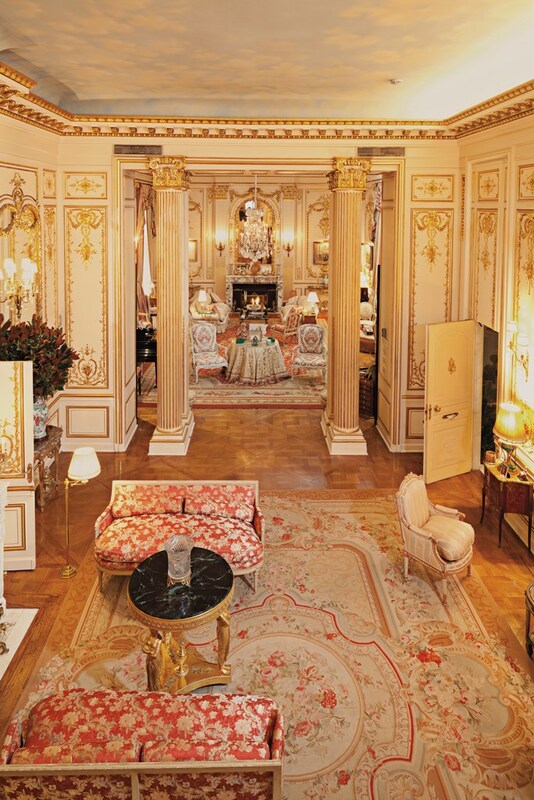 Hence, this luxurious smoking room, intended for sipping and smoking. A very different woman from Susan Mary Alsop, who was featured here on Wednesday, was Joan Rivers, the legendary comedienne and home-shopping pioneer who died in 2014. I was a longtime fan of Rivers, and I still find it hard to believe that she is no longer cracking jokes nor selling her jewelry on QVC. But interest in Rivers remains high, which is why I predict a lot of buzz regarding Christie's upcoming sale of Rivers' personal collection. If you've seen photos of Rivers' penthouse apartment, you might (or might not) agree with me when I say that her home was a tad grand. That being said, I always admired Rivers' appreciation for fine-quality things, whether they were antique bibelots, furniture, jewelry, or art, all of which are featured in the Joan Rivers sale. 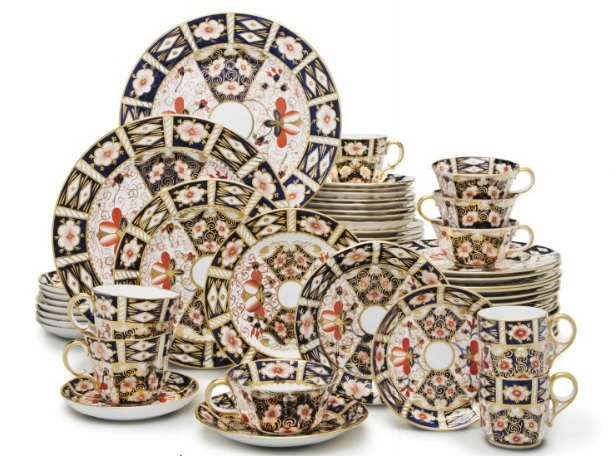 The lots that especially caught my eye were the Fabergé objects, of which Rivers was a noted collector, and the porcelain, sterling silver, and crystal pieces that Rivers was known to use at her elegant dinner parties. 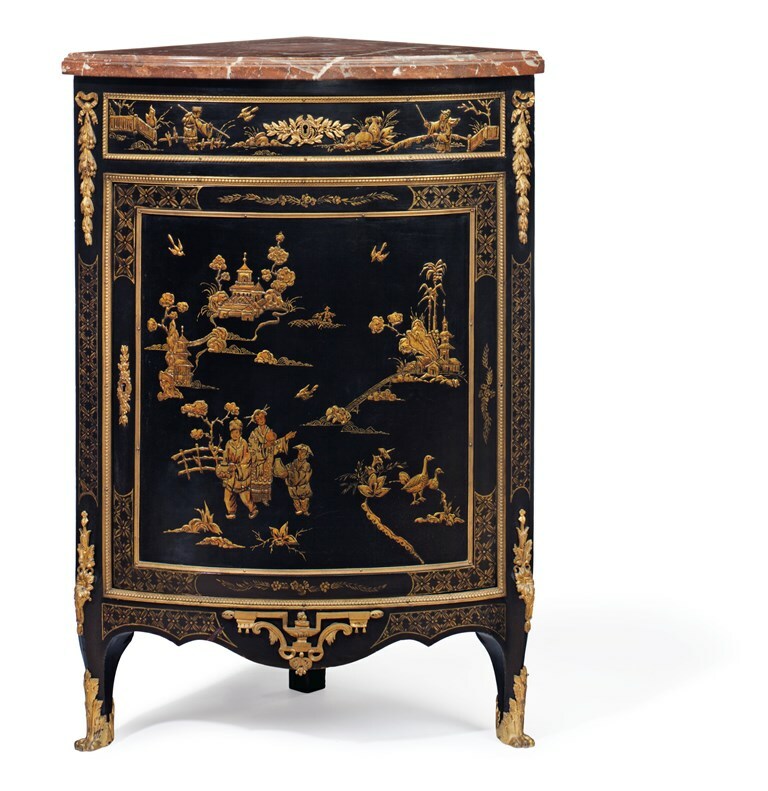 The Christie's sale will take place June 22, 2016. To see all of the sale's lots, or for more information, please visit the Christie's website. 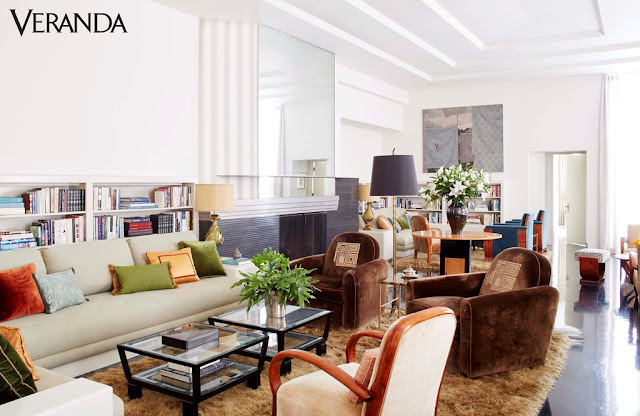 Below, you can see some of the lots that caught my eye, plus numerous photographs of Rivers' New York apartment that appear in the auction catalogue. I'm certain that many of you are familiar with the late Susan Mary Alsop. A descendant of John Jay, Susan Mary led a most interesting life. 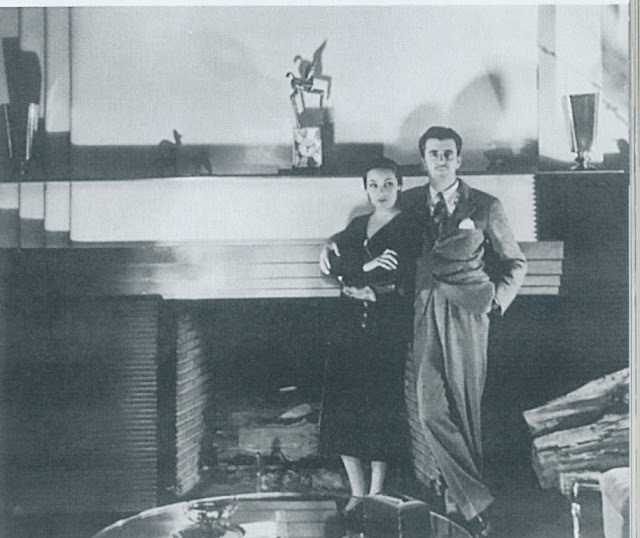 During her marriage to her first husband, Bill Patten, Susan Mary lived in Paris, where her husband's position at the American Embassy introduced her to an array of diplomats, artists, and sundry sophisticates. 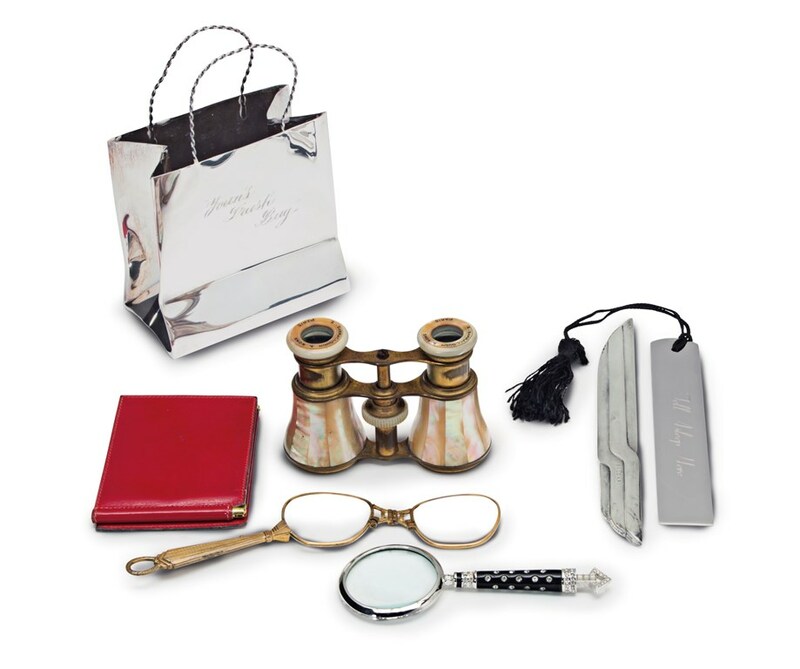 It was also during her time in Paris that she had an affair with Duff Cooper, who fathered Susan Mary's son. This fact was not revealed until the child was well into adulthood. 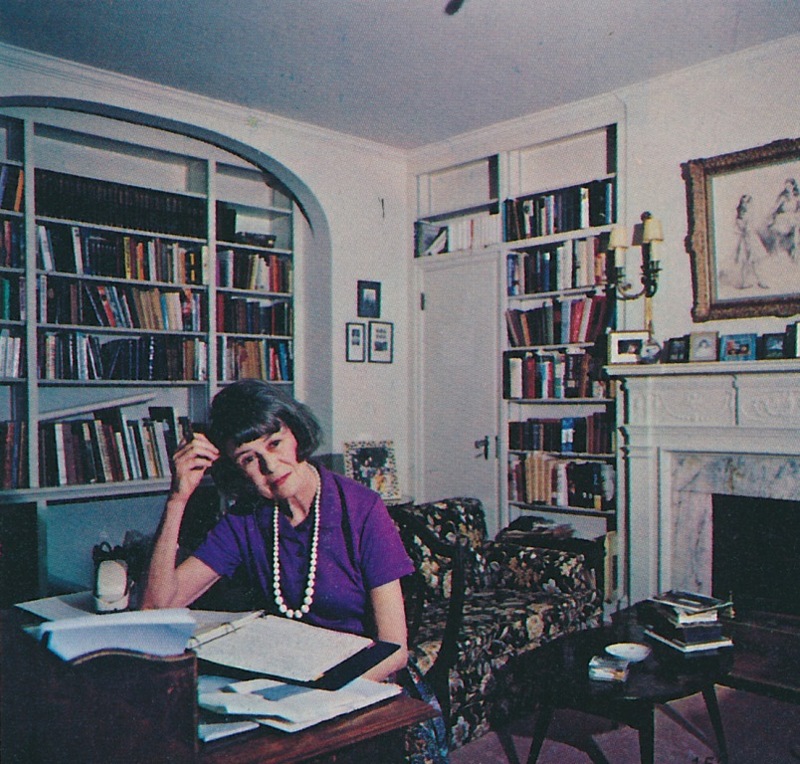 The Pattens eventually returned to the States, settling in Washington, D.C. After Patten's death in 1960, Susan Mary married prominent journalist, Joseph Alsop, a former college roommate of Patten. Susan Mary and Joseph were among the leading lights of Washington society, known for their inveterate entertaining and their friendship with the John F. Kennedys. In reality, Joseph Alsop was homosexual, and the marriage eventually ended in divorce. But still Susan Mary carried on, eventually writing a number of books, including a compilation of letters between Susan Mary and her great friend, Marietta Tree, as well as a biography of Lady Sackville. 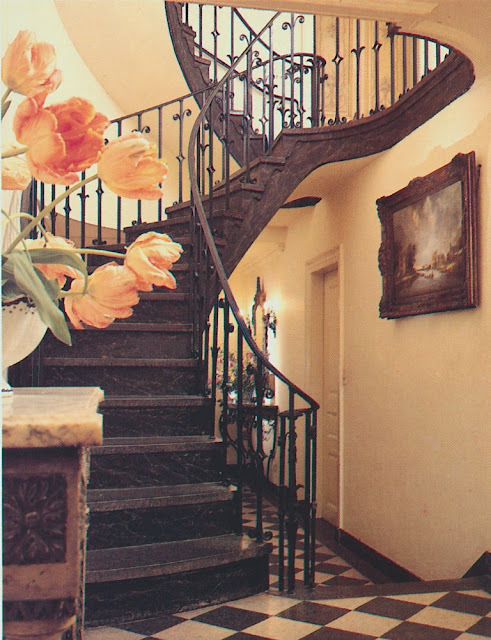 The photos you see here show Susan Mary and her Georgetown townhouse in 1980. Taken by Horst, the photos capture a home that is the essence of WASPy city living. Family portraits and antiques communicated Susan Mary's illustrious family history, while traditional fine fabrics, such as Brunschwig's La Portugaise, added a layer of well-mannered comfort. 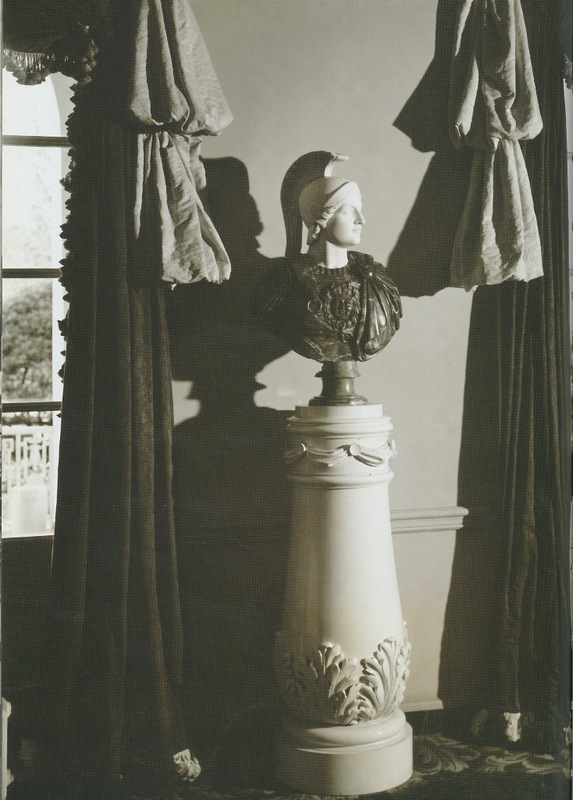 Decorated by the talented society decorator, Mrs. John Pierrepont, the townhouse is just as I pictured Susan Mary Alsop's home to be. If you're interested in learning more about the life of Susan Mary Alsop, I highly recommend you read American Lady: The Life of Susan Mary Alsop. It's fascinating and would make for a great beach book.